The B5N2 is a Rank II Japanese naval bomber with a battle rating of 1.3 (AB), 1.7 (RB), and 2.3 (SB). 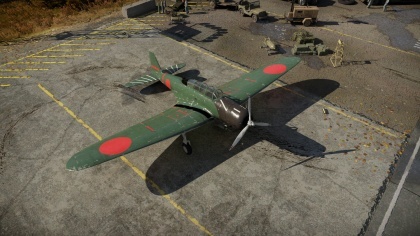 This aircraft has been in the game since the start of the Open Beta Test prior to Update 1.29. 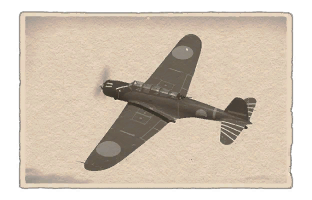 When flying the Nakajima B5N2, always try to avoid enemy fighter aircraft as the defensive armament is very weak. Its a very capable naval bomber overall in the right hands as its very maneuverable. The most important advantage in arcade is the ability to reload bombs and belts midair. This translates especially well with the B5N2. I'd advise against the 800 kg bombs, because the H6K can carry twice as many in exactly the same games. Instead, focus on the enemy ships or pillboxes. Make quick diving attacks, and retreat to the safety of your team's fighters to reload. Staying as low as possible can be a viable strategy, as it is difficult to safely conduct a diving attack on an enemy hugging the trees. If limited to 60 kg bombs, focus on enemy AAA. Using the 250 kg bombs to destroy enemy ships, or the 60 kg bombs to target AAA is the most helpful thing you can do for the team. Try to distract any enemy that comes after you, or lead them into the guns of your allies. Every minute an enemy is focused on you is a minute your allies don't have to deal with it. Use the environment to hide your approach. Hills, mountains, and clouds are all great tools to hide from enemy fighters, or shield your approach on enemy AAA. If necessary, use the tail gunner to strafe light targets. Shoot any approaching fighter. They know you will probably fail, but they also know people can get lucky. When upgrading this plane focus on getting the payload especially the torpedo modification. This is due to the high chance Japan has to get naval maps. The Nakajima B5N2 (Allied code name: Kate) was a plane first flown in January 1937 for the Imperial Japanese Navy. About ~1149 Nakajima B5N Torpedo bombers were made for the Japanese Navy. It would see service in World war 2 and was the Japanese Navy's primary torpedo bomber for the early part of World war 2. The Nakajima B5N Torpedo bomber was credited with the sinking of three US Carriers the USS Lexington CV-2, USS Yorktown CV-6 and USS Hornet CV-8. This page was last edited on 20 December 2018, at 01:47.